Now, this is radio! Live radio from more than 150 countries and in 75 languages, and a huge variety of programming from each country. You can listen to 41 different stations broadcasting from Japan, 345 from Italy, 20 from Bosnia, 7 from Iran, and even 5 from the island of Fiji! Radio anywhere and everywhere. If you thought radio was dead, think again. 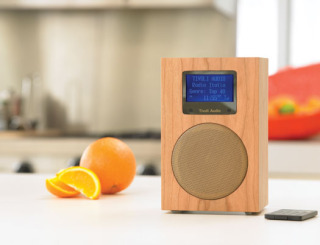 The Tivoli Audio NetWorks Global Audio System is guaranteed to give radio new life. It's not just the great sound of the system, but the breadth of its range. This is not your grandfather's short wave radio with the weak transmissions and accompanying, deafening static. And there are so many more features. Read about them here or watch the You Tube introduction below (6 minutes, 43 seconds). The Tivoli Audio NetWorks Global Audio System received the 2009 Design & Engineering Showcase Award and a 2009 iF Design Award. It is now up for the T3 Home Gadget of the Year award, which is voter supported. If you would like to see all the countries, languages, and formats of the radio stations that can be reached on the Tivoli Audio NetWorks System, visit the Tivoli Audio NetWorks Global Community. Invent Six-Ringed Wearable Art, Win $4,000!